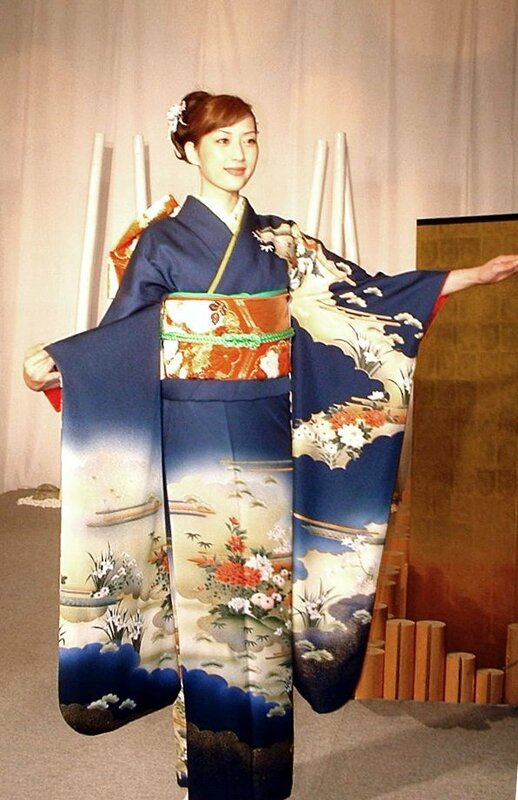 Kimono is a traditional costume in Japan that makes women and men look elegant. Thanks to the wide range of seasonal designs, the kimono also reflects the natural beauty of Japan. Kimono, along with all the additional elements, looks complicated and it certainly is when it comes to wearing it. Usually, you need another person which can tie an obi in different ways, especially if it is a special occasion outfit. Obi, or sash, makes the kimono even more beautiful. It is more than 3 meters long and usually the obi is tied in a beautiful and often elaborate knot. However, the kimono itself is a simple outfit, it consists of eight rectangular strips connected together. Kimono comes from ancient times and for many years various techniques of his weaving and dyeing have been created, and even there was a time when some of them were forbidden. During the times of samurai, extravagant kimono was banned. This inspired the revolution in the world of kimono. In the early 20th century kimonos with bold new designs appear which are also popular today thanks to the new generation of young women. Over the centuries, kimono reflected both the aesthetics and the economical, practical ingenuity of the Japanese people. Kimono is like a canvas of traditional Japanese art, craft and design. The history of the kimono goes back around 1000 years. Aristocrats at that time wore garments with many layers. The inner layer with narrow sleeves served as underwear. And this layer became the original of today’s kimono. This formal, multi-layered costume was called Juni-Hitoe. In the fourteenth century, when the samurai began to take over power, a narrow sleeve in a kimono began to dress on top which was convenient and practical for warriors. Eventually, it became a standard outfit for both women and men during the samurai period. The choice of color has long been part of the pleasure of wearing a kimono but over the centuries patterns have become more important. Kimono presented great techniques of embroidery and dyeing. When Japan benefited from the years of peace and business prospered, people were looking for more decorative clothes. The main creators of fashion in those days were kabuki actors and courtesans. In the sixteenth century there was the development of fashionable kimono. Among the women in the samurai class were the artfully woven, crinkled and embroidered kimono. Over time, this type of kimono has also spread to wealthy merchants. When the style of the kimonos matured, the obi grew wider and longer. It was dyed and decorated with woven patterns and embroidery. However, Shogunate preferred austerity and periodically limited everyday clothing that would be too colorful or luxurious. In 1693, the key event in the history of kimonos took place. Shogun forbade flaunting with wealth and luxury and the prohibition also included decorative kimono. The gold embroidery was considered to be unnecessary and forbidden. Even the usual embroidery was banned, as was the fabric covered with tiny, dyed patterns. This law began a new era in the history of kimono. It all started in Kyoto with the birth of a completely new technique of kimono decoration. Instead of using the forbidden embroidery, colored compositions were applied directly to the fabric. First, the contours of the pattern were drawn with a special paste that was resistant to dyeing. The pattern was then filled with colors and the paste acted as a barrier to prevent color mixing. After applying the colors, the fabric was washed which removed the paste and leaving white contours. This new technique of dyeing from Kyoto got around the shogunate rules.Another method was to introduce a pattern that at first glance is not rich but a closer look reveals various complex, colored motifs. One of them resembles a shark skin and consists of countless colored dots. Each dot is half a millimeter wide and they are arranged in waves. Other kimonos were dyed as a chessboard. Inside each square was a chrysanthemum flower. Many symbols considered to be happy were used as patterns on kimonos. 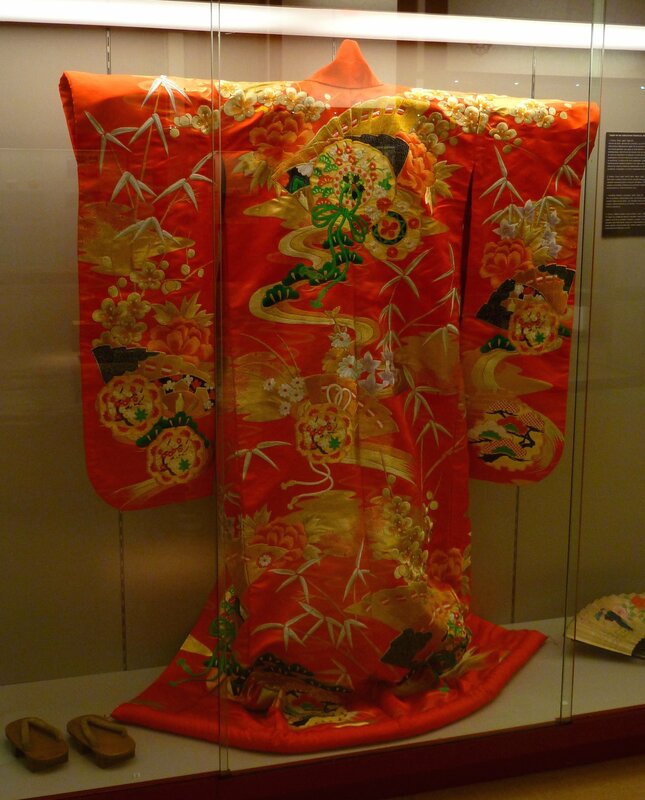 After the end of the shogunate, a flashy kimono returned in the middle of the 19th century. Modern kimono was created only about 300 years ago. It is a one-piece clothing that has no separate top and bottom. Long sleeves are another hallmark, the more formal the dress is, the longer its sleeves, which may even be one meter long. In the mid-twentieth century, Western costumes began to wear every day. Kimono has become a clothing used only for important events in life. For children, these are visits to temples for the purpose of prayer, girls dress kimono at the age of three and seven, and boys at the age of five. 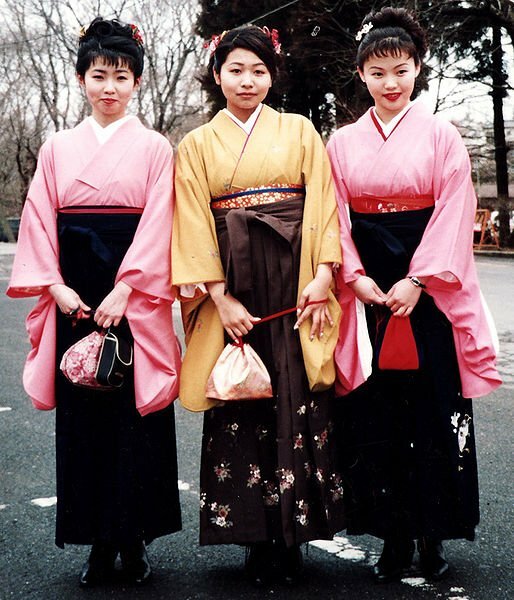 It often happens that women dress a kimono for the graduation ceremony. It’s a kimono in combination with a hakama, or pleated pants. For centuries, hakama was worn mainly by men but women took over them in the nineteenth century. Hakama provided much more freedom of movement than a kimono and became a symbol of emerging opportunities for women who could start to study and work. A stylish kimono with an effective hakama has become a traditional outfit at the end of school. 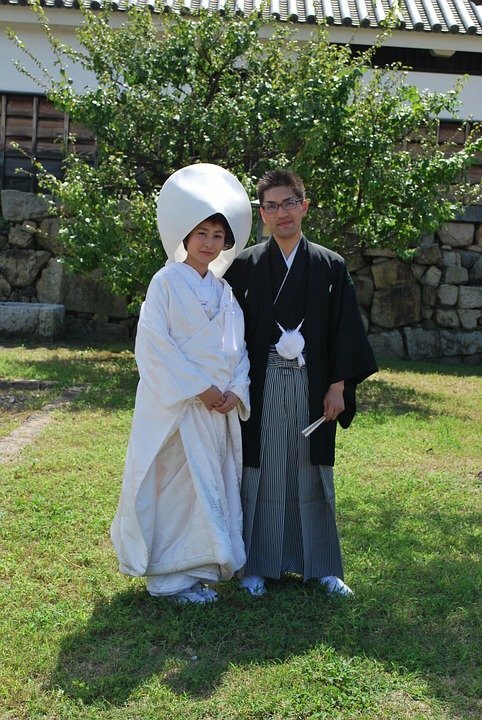 Many couples still get married in traditional Japanese costumes. For the bridegroom, it is a combination of a kimono with hakama and family crest. A white wedding kimono is for the bride. Nowadays in Japan you can not see that many people wear kimono but when they do, they certainly look very stylish. This tradition is certainly the most practiced in Kyoto. In Kyoto geisha and maiko, or the owners of traditional teahouses and ryokans, still wear kimono every day. There are several special rules for wearing a kimono. One of them is that married and unmarried women wear different kimono. 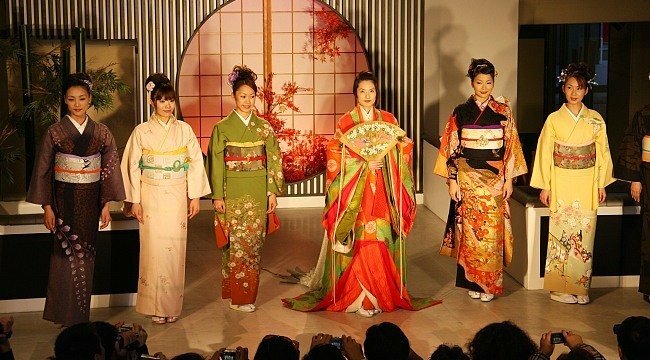 Kimonos of unmarried women are very colorful, have a rich design and wide sleeves. They always attract the eye thanks to the stained, embroidered patterns and sleeves that almost touch the ground. A married woman dresses a kimono with narrow sleeves and the basic color is black. Her kimono is also beautifully decorated, but the pattern is only at the bottom of the kimono. There is also a family crest in the upper back and sleeves. For both married women and unmarried women, these kimono are the most formal attire worn on special occasions, like a wedding or New Year. 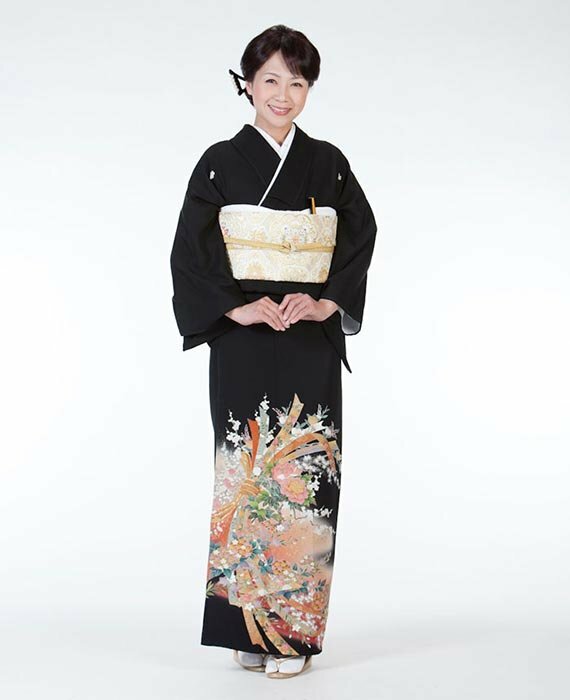 On semi-formal occasions, both married and unmarried women wear the so-called visiting kimono. 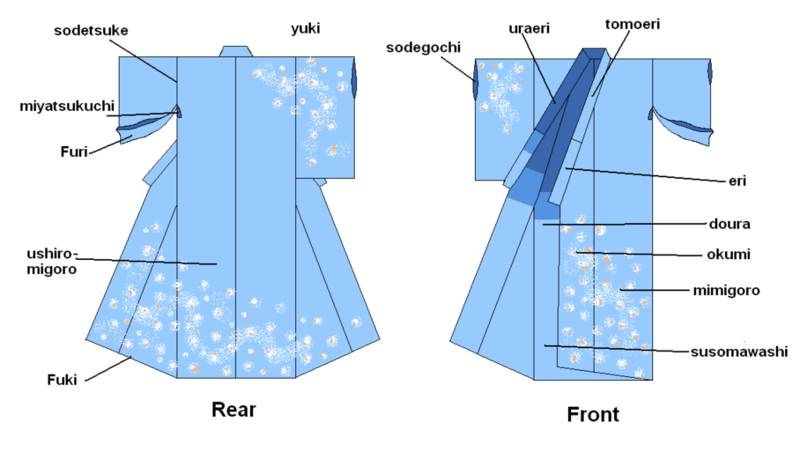 Unlike the official kimono with a narrow sleeve, the visiting kimono has rich patterns on the shoulders and sleeves, as well as the lower part. They are worn at meetings in tea rooms, parties and other social visits. It is extremely important to wear the right kimono at the right time and place. This also includes compliance with many conventions related to seasons. From October to May, when it is colder, you should wear a kimono with a lining. From June to September, when it’s hot, it’s time for a kimono without lining. And on the hottest days of summer silk kimonos are worn. This kind of kimonos means that not only the person who wears them feels cooler but also the people who look at the kimono. Every day, in summer, you wear a yukata. It is a lightweight cotton or linen kimono from at least 300 years ago, which was originally worn only at the local neighborhood. Nowadays, many people wear a yukata for events and festivals that take place in the summer. It is a light, comfortable outfit in which the sleeves serve as pockets. Not only materials suitable for different seasons are used but patterns on the kimono are also associated with them and seasonal motifs are popular. These will be mainly plants and other elements of nature whose life cycle depend on the seasons. In the spring it will be cherry blossom and dragonfly motifs, in autumn maple leaves and in winter camellia, plum blossom or snow. 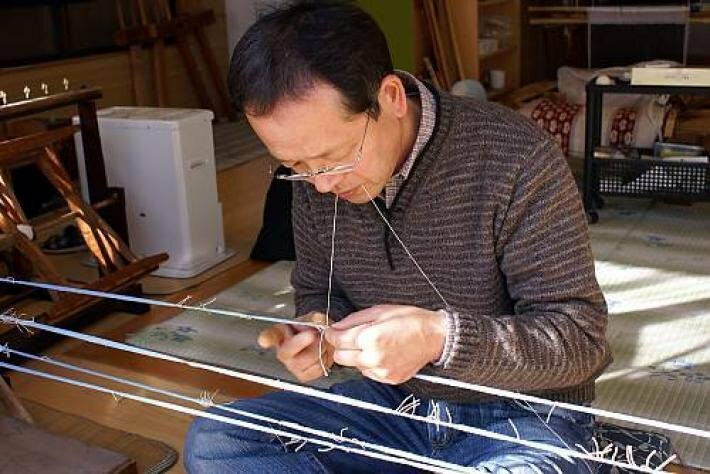 Kimonos are constructed using a special method. Before the kimono is sewn the fabric is ironed to align and tighten up the weave of the fabric. This is an essential task, without that the fabric would shrink later on. Then it is cut into rectangular strips of fixed dimensions which are sewn together. 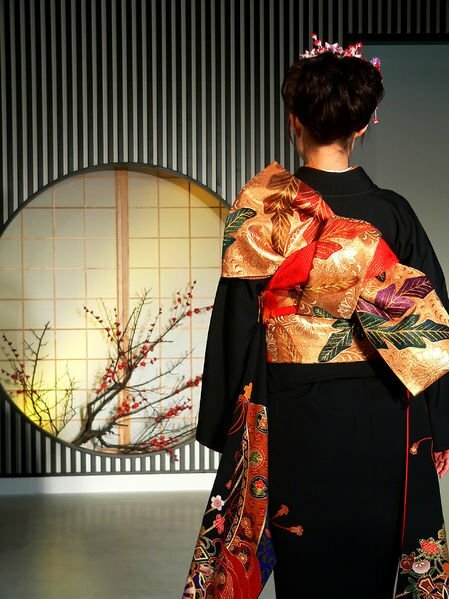 Unlike western clothing made of pieces of fabric with curved and straight edges, the kimono is made only from pieces of fabric with straight edges. Kimono may look complicated but its design is very simple. Thanks to this, you can also always cut the seams to wash the kimono or to renovate it. Proper care means that kimono is passed from generation to generation and it is easy to adapt a kimono for another family member. 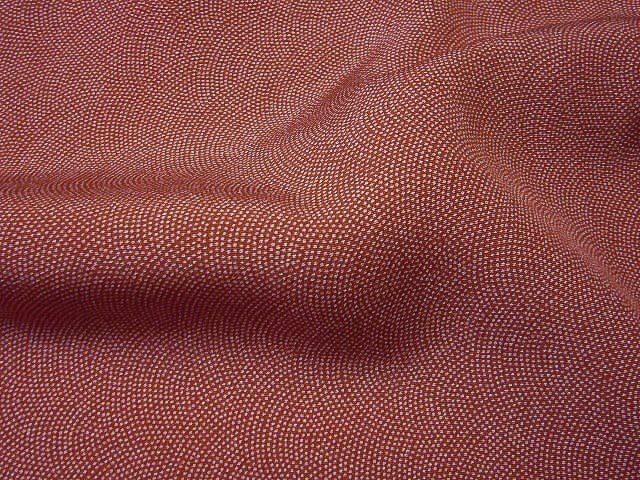 An important part of creating a kimon is to show the pattern on the fabric. The most visible part is the chest, so the left side of the chest is the focal point. The second focal point is the area below the knees. In these places will be the most beautiful designs. The obi is another richly decorated part of the kimono. The typical obi is about 30 centimeters wide and 420 centimeters long. Traditionally, it is woven from silk and has ornamental patterns. It is designed to emphasize the beauty of a kimono. Obi takes on a different look depending on how connected it is and there are over 100 ways to tie obi. The obi in wedding kimono is often tied in the shape of a butterfly. The diagonally bound knot is bold and dynamic. This is a popular knot among girls and young women, it is usually used with wide-sleeved kimono. Kimono can also be divided according to the fabric from which they were made. It may be a white fabric that is dyed or fabric can be made of threads that are first dyed and then woven to create patterns. In the Kyo-yuzen technique, patterns are painted on white material, just like on canvas. Yuki Tsumugi, on the other hand, is the intangible cultural heritage of UNESCO and the important folk cultural property of Japan. The production of Yuki Tsumugi fabric begins with the spinning of special threads. Silk cocoons are untangled and then thin threads are formed with saliva. They are colored using the masking technique. The thread fragments that should remain white are tied and then the thread is bathed in the dye. This results in threads with some of the parts dyed and some of them are undyed. The pattern is created by weaving a partially colored thread according to the scheme previously developed. Proper design of the pattern requires extremely precise weaving which takes at least three months to weave enough fabric to one kimono. Kimono made with this technique without a pattern costs about 5000 dollars, with a pattern over 10,000 dollars. 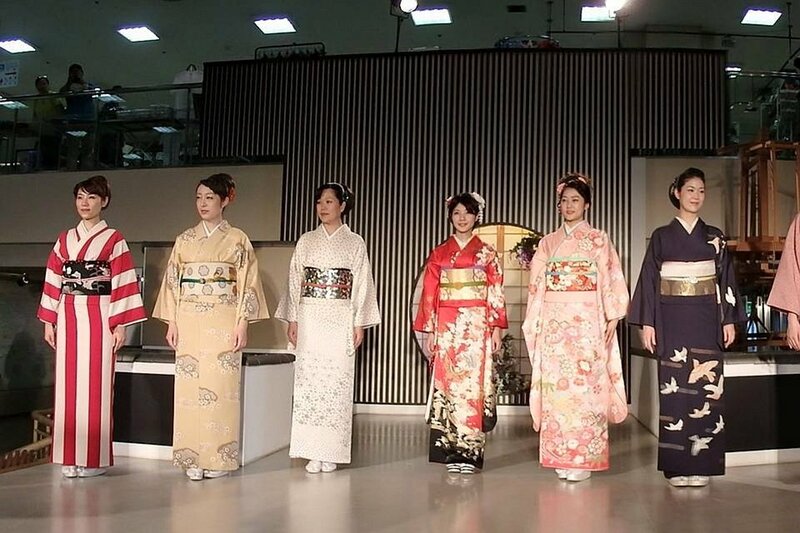 Many regions of Japan are famous for producing characteristic kimono fabrics. In the Niigata prefecture, the summer kimono fabric is made in the winter. A lot of snow is falling there which plays a key role. The threads of the fabric are linen and have a yellowish hue. The fabric made of them is woven on fresh snow on a clear winter day. When the water vapor released by the melting snow is exposed to ultraviolet radiation, ozone is generated and the ozone has a bleaching effect. This results in whitening the fabric. Oshima is an island with a hot summer. 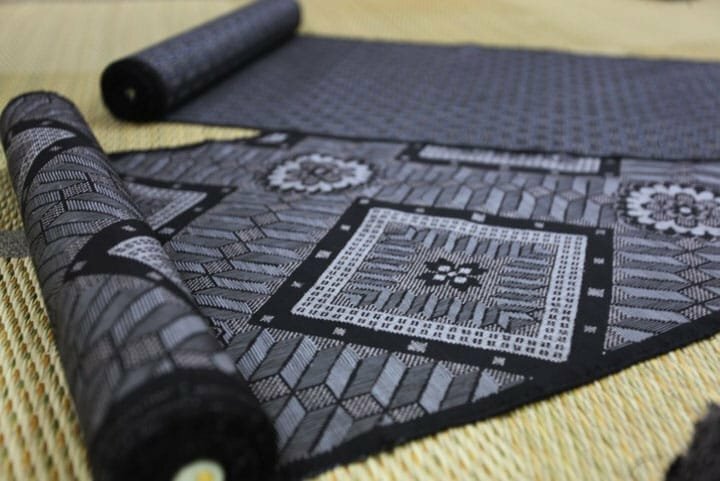 It produces a kimono fabric called Oshima Tsumugi, which has a characteristic black color. The dye is produced in the fermentation process involving local plants. It is applied to the fabric, then it is dipped in muddy water. Tannins in the dye and abundant iron in the mud react with each other and dye the fabric into deep black. An average kimono can be worn for three generations and can easily last for a hundred years. From time to time it must be completely dismantled for individual parts and washed. In Japan, there are ways to restore the fabric using techniques that have been used for centuries. After washing, the fabric hangs on bamboo ribs that stretch the wet silk. It takes about 300 ribs to stretch one piece of material. Then a starch is applied that makes the fabric look like new. This renewed fabric can be adapted to the size of another family member or you can use only part of it to do something completely different. Thanks to this, the kimono of ancestors are still present in the lives of the Japanese families. In recent years, more and more people wear kimono not only for a traditional occasions but also as fashionable outfit. Kimonos are traditionally made of silk, linen or cotton but synthetic fibers have made them much cheaper. However, if you want to have a kimono which was hand-made with traditional methods, it will cost thousand of dollars. Fortunately, in the shops with used kimonos, you can find real pearls.